The foundation footings for the original coal dock are still visible in the Chama Yard. They are just south of the end of the current coal tipple dump track. The date of 1924 sticks in my pointed head as the date the current tipple came to be. 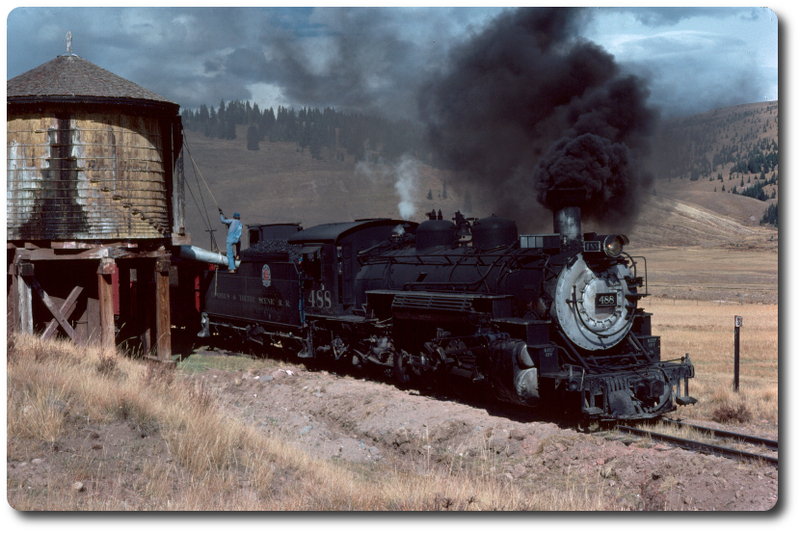 The FM engine inside the hoist house of the Chama Coal Tipple was direct drive to the hoisting machinery. Before commercial electricity arrived in Chama (late 1940's I believe), there were two sources for electricity. The saw mill generated power for their own plant and some of the houses in the immediate area. In addition there was a power plant located on Pine Ave. about 3 houses south of 1st St. It had some sort of internal combustion engine to power it. The last time I looked, there was a rather non-descript house there. Back in my day, the local emergency ambulance/police dispatcher lived there and in the back hard was a rather tall antenna. We used to jokingly call the place "Radio Free Chama". As to what power was down at the RR, I really don't know. They had the boiler plant in the roundhouse, but I think it was limited to running the water pump for the tank, running the stationary engine for the machine shop and providing steam heat to the roundhouse office and depot. They may have had a generator for local power as well.